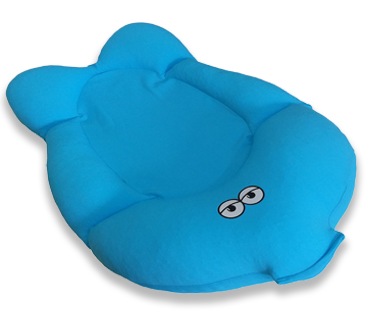 Read This to give your baby the joy of a bath on a soft baby bath seat cushion, that allows safe movement and motion even for newborn babies. Reading this will be very worth your while. It may even change your and your baby’s life for months to come! Yes! Your baby’s bath can become a pleasurable safe snug time – with your little one splashing the water in playful joy, from the very first bath! Your baby’s joy, fun and just being happy moment to moment, relies on his or her ability to feel safe, loved and secure in the immediate environment at all time, while at the same time, enjoy a way to release any unwanted energy building up in that tiny body, either by letting go of this energy as heat (physically into the body of a hugging mom or dad), or through moving the arms and legs. A baby’s bath is a perfect time to give your beloved an outlet for some of that energy in a fun delightful way. You want your baby to feel a soft warm hug, to have a sense of safety and to develop without hindrance or delay. All mothers want their babies to have it all if at all possible, I know I did – and still do. The thing is, if you just carry on using the bath you’ve been using, the same way you’re used to, then you should know that your back and neck will more than likely begin to ache from hunching over that bath in order to be holding your baby safely throughout the bath (if they haven’t already begun to ache). In addition to that, your baby will suffer the consequences of lying on a rigid surface without the ability to move in a flexible way – namely your baby will become more rigid, be more irritated, especially when it’s time for sleep (can you stand to lose even more sleep? ), and will be more likely to develop illnesses related to stagnant blood or energy. You see? We’ve all been following the idea that it’s “normal” to bathe a baby in a hard surface bath. “Put a towel over it to make it softer”, they tell moms. But the truth of the matter is that a baby’s body is soft and gentle, and it’s not meant to be lying flat and motionless on the back. Only recently have moms begun to realize that it doesn’t have to be this way, and started using some sort of solution to make the surface they lay their precious ones on a little bit less hard and rigid. Your baby is enjoying a bath on a soft cushion, that allows movement and motion. Your little one’s back is completely supported, which gives a sense of warmth and safety, almost as if you were holding that tiny body in your own arms. Small arms and legs are splashing the water with joy, and little sounds of fun and laughter fill the air. 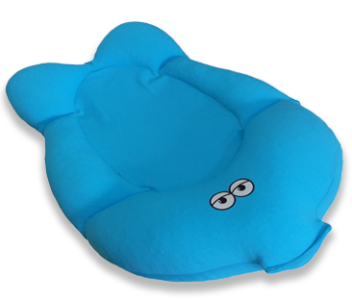 With the Batya baby bath seat cushion you and your baby is getting all of that and more. The Batya’s soft fabric, and its thousands of tiny Polystyrene balls filling, make it react and adjust itself to the baby’s body, posture and movements, creating complete support and a feeling of enveloped safety. Bath time will never be the same once you start using Batya. When we our first daughter was born (more than 10 years ago), we wanted to find a nice safe fun bath seat, that would be both comfortable for her, and inspire confidence in us – but all we could find was either small baths, which were too rigid in our eyes, or plastic seats that held her legs in such a way that it looked like they were pressing against her gentle body in an unnatural way. Since we were both fresh out of design school, we sat down and started to think: what would actually be a good bath seat solution that would go in alignment with a baby’s natural body shape? This is how we first came up with the idea of a cushioned seat, which takes the shape of the body instead of trying to shape the body to the seat (absurd, right?). 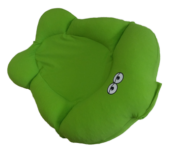 We started looking more into that solution, and looked everywhere we could think of for a soft, cushion like baby seat – but couldn’t find one anywhere. Ever since then, we’ve worked on making Batya more comfortable for babies, and of course more safe and secure. Batya is handmade with the highest standards in mind to give you and your baby the best opportunity to experience joyful bath times day after day for a long time. Order Batya for your baby today! And give your little one so much more fun, joy and developmental boost from day one. Place the Batya in a shallow bath tub, eyes facing up. Place your baby on the Batya with his head on the widest side of the product (in the eyes print part). You may support baby’s neck with your hand. Batya is of 100% synthetic fabric that resists mold and mildew (not mold or mildew proof) and is made to be used in water. 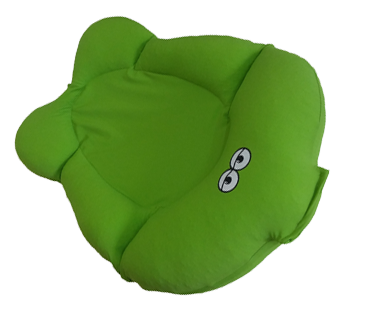 Batya bath cushion is single part unit that does not require assembly or any other/additional parts. The Batya can be used in both infant and standard bathtubs. Measurements: 60X40X15 cm. 24X16X6 inches. 300 gr. / 0.7 pounds. If your infant requires oils or moisturizers we suggest these be applied immediately after bathing your baby, so they are not absorbed into Batya. ALWAYS keep baby within adult’s reach! Certain environmental factors may cause your Batya to develop mold or mildew which we cannot control. Batya is not mildew proof and we make no such claim. To extend the life of your Batya bath seat, after each use, rinse well with clean hot tap water to remove remainder of soap and body cells from bather, pick up and hang up in well-ventilated area for drying with the attached hanger. Do not place behind closed shower curtain or inside closed unventilated room. 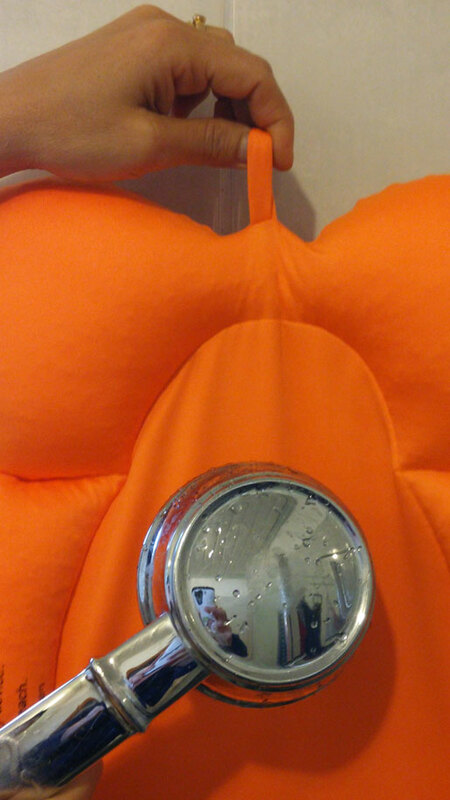 Your bather can be used even if still moist or wet between showers. If necessary, you may wash your Batya in large capacity washer on delicate or hand wash cycle setting. Use a detergent that does not contain any fabric softener and non-chlorine bleach if needed. Dry on lowest heat setting. Certain baby soaps which contain oils or are enhanced with moisturizers trap oil in the filling of the Batya seat and may cause it to mold or mildew because it cannot dry properly. This is not a defective property of the Batya. NOT A SAFETY DEVICE Babies have DROWNED while using bath seats. ALWAYS keep baby within adult’s reach. STOP using when baby begins pulling to a standing position (approximately 10 months of age). PREVENT DROWNING. Babies can drown in as little as 1 inch of water. ALWAYS bathe your infant using as little water as necessary. Babies can drown even when other children are in or near the bathtub. DO NOT allow other children to substitute for an adult. An adult must be present and within arm’s reach at all times while this product is in use regardless of the circumstances. Do not remove labels. Tearing off label may damage seams. Use label for future reference. For use while bathing baby only. Do not place in crib, playpen, bed or swimming pool. NOT a flotation, sleeping or napping device. Children have DROWNED while left unattended in bath. ALWAYS keep child within arm’s reach. Temperature for bathing a baby should be between 90 and 100°F (32.2 and 37.8°C). ALWAYS test baby’s water before placing baby in water. Discontinue to use of the product if it becomes damaged. Discontinue to use of the product if seams become damaged , if fabric is torn or if mold occurs. Thank you for choosing Baby Joy!